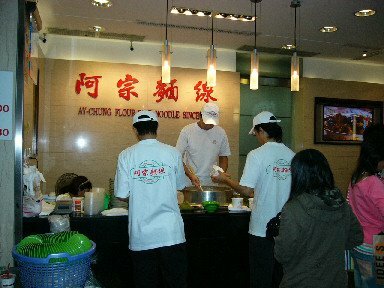 Another must-try in this culinary center is this sticky noodle made using traditional Fujian longevity noodles, with either oysters or intestines or both (I know this does not sound very appetizing to some, but trust me its delicious). It’s almost like a stew, and is eaten with a dash of black vinegar, hot sauce (be warned, this place has a very lethal hot sauce) and a generous sprinkling of Chinese parsley. There are many such stands throughout Taiwan but the place to go eat this is Ay-Chung’s at Hsimenting (nearest MRT Hsimenting). Its not surprising to find long queues at this shop that has no seats. And diners literally slurp the noodles up, while on their feet! It costs NT$35 (US$1) for a small bowl and NT$50 (US$1.50) for a large one.